Last week, Seth Godin, author, thought leader and publishing innovator announced he was returning to his traditional publisher, Portfolio, to publish his next three books. At the same time, he was launching a new experiment using Kickstarter to measure interest among his followers for his new book. The text from the Wall Street Journal article that covered this announcement is copied below. It is worth the read. …his hybrid approach—which essentially supplements his publisher’s efforts with his own promotional work—could well become an industry template because it eliminates much of the uncertainty for booksellers and publishers deciding which titles to bet on.Godin has long been one creating new models for publishing.. I find this change in direction a bit surprising and also instructive to any author thinking putting a book in the market in the new world of publishing. Here’s some of things I think we can all learn from this latest development. 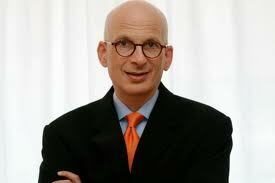 Seth Godin returns to his traditional publisher. A big platform does not always guarantee book sales–Even with Godin’s following, some of his self published books struggled to achieve the sales he hoped for. It wasn’t because of a lack of effort or even publicity, but readers purchasing habits are hard to predict. I find at times, first time authors believe if they do everything they read, it guarantees success as if selling books is like a math problem. Now that doesn’t mean you should not follow sage marketing advice, build a platform and get creative in your marketing efforts, but it doesn’t mean you will always have big sales. Being an author is as much about the journey as the destination–Despite this change of strategy by Godin, I don’t think he has failed in any way. His decisions and risk taking have helped fuel discussion and debate about how authors and publishers and readers and agents will relate in this new world. If you only measure your impact as an author by book sales, you miss the point. A book gives you a platform from which you can impact people’s lives. That is what makes becoming an author such a worthwhile pursuit. Publishers and authors will share the risk together going forward–Whether it is through self publishing or through ideas like Godin’s current Kickstarter plan, authors and publishers are each going to have some skin in the game when it comes to bringing books to market. The days of publishing companies putting up all the money are likely gone except for a few exceptional authors. Creativity is still one of our most valuable resources–Godin has always been willing to try new things and been very creative about how he promotes his books. We can all learn from that. Take some risks. Some will work. Some will not. That’s OK as long as you don’t take a second mortgage to promote your book. And when in doubt, remember point number two in this post. Seth Godin, the best-selling business author who jettisoned his longtime publisher Portfolio in August 2010 in favor of selling his books directly to his readers, is now returning to Portfolio and will publish three new titles in January. Bloomberg News Author Seth Godin says testing reader interest could reduce risks. But Mr. Godin, a marketing iconoclast known for titles like “Purple Cow: Transform Your Business by Being Remarkable,” is taking an unorthodox path. A champion of new approaches to business, Mr. Godin decided to test online whether readers would be interested in his new books before the works actually hit the shelves, a decision that he says could make publishing and selling books considerably less risky in the future. For Mr. Godin, his hybrid approach—which essentially supplements his publisher’s efforts with his own promotional work—could well become an industry template because it eliminates much of the uncertainty for booksellers and publishers deciding which titles to bet on. Mr. Godin began his publishing experiment in June on Kickstarter, a website that enables people to solicit funds from individual investors. Before agreeing to his new deal with Portfolio, an imprint of Pearson PSO -0.50%PLC’s Penguin Group, Mr. Godin hoped to gauge interest from readers in the three new projects he had in mind. To potential backers, he presented a variety of pledge packages—that is, different levels of financial support for the projects bring perks for individuals, such as previews of the books and copies autographed by the author. The lead title he offered is “The Icarus Deception,” which he describes online as looking at “how our economy rewards people who are willing to stand up and stand out.” There is also an illustrated book for adults titled “V is for Vulnerable” adapted from one section of “Icarus,” and a compendium of previous writings. The Kickstarter campaign began on June 18 at 5:50 a.m. By 8:15 a.m., he’d reached his pledge goal of $40,000. By the end of the next day, he had exceeded his personal goal of pledgers signing up for 10,000 copies. Mr. Godin’s followers continue to sign on to the Kickstarter campaign. As of Sunday at 1 p.m., the pledges totaled $232,000. Since the pledge window remains open until July 17, the total could move substantially higher. Mr. Godin’s experiment comes as publishers and authors alike seek out new ways to build stronger direct ties with readers. “You have to go direct to consumers today because it’s gotten harder to get attention from general media,” said Dee Dee De Bartlo, a principal in the marketing and publicity firm February Partners. She herself is taking a direct approach in marketing a new title from Rodale Press, “The Starch Solution,” which preaches the benefits of a plant-based diet. Her firm is targeting self-proclaimed vegans on Facebook. As for Portfolio, it believes that the early copies that Mr. Godin sold will generate wider consumer interest when the book is distributed to stores and online. $49 or more: four copies of ‘Icarus’ plus access to the preview digital edition. $111 or more: eight hardcover copies of ‘Icarus’; two signed copies of ‘V is for Vulnerable’; a limited-edition essay collection; digital preview. $1,150 or more: Mr. Godin will interview each participant and write a brief account of an artistic accomplishment that will be included in ‘Icarus.’ Pledgers also get eight hardcover copies of ‘Icarus’; two signed copies of ‘V is for Vulnerable’; an essay collection; the digital preview.